The business of combat sports is one that thrives on the idea of “big fights.” Floyd Mayweather vs. Conor McGregor fit this mold. The penciled in bout between Jon Jones and Brock Lesnar would have fallen into that category as well. 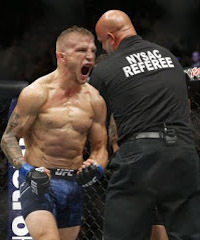 With TJ Dillashaw snatching the bantamweight title from Cody Garbrandt at UFC 217, there’s a rumbling for another big fight, this one pitting Dillashaw against Demetrious Johnson. This isn’t the first time this fight has been proposed, but it's never been more intriguing. Those in the know within the MMA sphere look at Johnson as an icon in the sport. He’s considered to be the pound-for-pound best fighter, and has dominated opponents for most of his UFC career. But if you ask a mainstream fan, one that's less in the know, you will get a drastically different response. To that fan base, Johnson’s not worthy of such high praise. The truth lies somewhere in between –- but more so toward the side that believes he’s one of the best to ever compete in the sport. That is where Dillashaw comes into the conversation. The new bantamweight champion turned his attention to Johnson as soon as the title belt was strapped around his waist. He claimed that Johnson “ducked” him for a “fake record.” (Johnson broke Anderson Silva’s title defense record when he defeated Ray Borg at UFC 216.) He continued that attack when he said that Johnson’s record should have an asterisk next to it, akin to those in other sports who’ve been found to have used performance enhancing drugs. In response to this lobbying, UFC President Dana White has returned to the soapbox to push the idea that Johnson needs to face Dillashaw next. Dillashaw’s performance on Saturday, along with Johnson’s performance at UFC 216, makes this potential fight much more compelling. Johnson has all but cleaned out the flyweight division, and Dillashaw is clearly angling for a big fight. With the 135 and 125 divisions struggling to draw ratings, pay-per-view buys, and overall fan interes, the organization sees this as an opportunity to leverage the appeal of two divisional champions to maximize intrigue, both for this bout and for whatever comes next for the winner. The presentation of such is important and that’s a hurdle for the UFC to tackle if this fight actually comes together in the future. Demetrious Johnson has yet to respond to either White's or Dillashaw's comments, and that’s what this idea hinges on. If “Mighty Mouse” decides to take the fight, the wheels then begin to turn for the "money fight" opportunity that has eluded him to this point in his career. He hasn’t ever been positioned as well as this fight could; he's never really been given a chance to prove that his star is capable of shining alongside the brightest in this sport. There’s a saying about much of life being about timing, and the timing is near perfect for a fight between Dillashaw and Johnson.